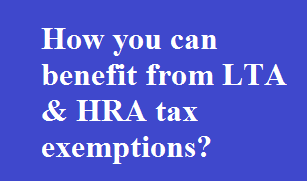 Home / Income Tax / How you can benefit from LTA & HRA tax exemptions? Salaried employees can avail the benefit of various tax exemptions with respect to allowances such as house rent allowance (HRA), gratuity allowance, leave encashment, conveyance/transport allowance, leave travel allowance (LTA) and many others given by their employers during their tenure of service. Section 10(5) of the Income-Tax Act, 1961, read with Rule 2B, provides for the exemption and outlines the conditions subject to which LTA is exempt. LTA exemption can be claimed where the employer provides LTA to employee for leave to any place in India taken by the employee and their family. Such exemption is limited to the extent of actual travel costs incurred by the employee. Travel has to be undertaken within India and overseas destinations are not covered for exemption. For example, where an employer provides LTA of Rs 35,000, but an employee spends only Rs 30,000 on the travel cost, then the exemption is limited to only Rs 30,000. Travel cost means the cost of travel and does not include any other expenses such as food, hotel stay, etc. The meaning of ‘family’ for the purposes of exemption includes spouse and children and parents, brothers and sisters who are wholly or mainly dependent on you. An individual would not be able to claim the exemption in relation to his parents, brother or sisters unless they are wholly or mainly dependent on the individual. Further, exemption is not available for more than two children of an individual born after October 1, 1998. This restriction does not apply in respect of children born before this date, and also in cases where one, after having one child, begets multiple children (twins, triplets, quadruplets, etc.,) on the second occasion. The LTA rules provide for a tax exemption only in respect of two journeys performed in a block of four calendar years. The current block runs from 2018-2021. If an individual does not use her exemption during any block on any one or on both occasions, exemption can be carried over to the next block and used in the calendar year immediately following that block. The individual needs to submit proof of travel to his employer and also keep copies for his own records. Proof of travel could be tickets, boarding passes, invoice of travel agent, duty slip, etc. HRA is received by the salaried class. A deduction is permissible under Section 10(13A) of the Income Tax Act, in accordance with Rule 2A of the Income Tax Rules. You can claim exemption on your HRA if you stay in a rented house and get HRA. The HRA deduction is based on salary, HRA received, the actual rent paid and place of residence. The place of residence is important. For Mumbai, Kolkata, Delhi or Chennai, the tax exemption on HRA is 50% of the basic salary, while for other cities it is 40% of the basic salary. 3) 50% of basic salary if you reside in Mumbai, Calcutta, Delhi or Chennai, or 40% if you reside in other cities. In order to claim the exemption, the rent must actually be paid for the rented premises which you occupy. For the purpose of this deduction, salary means basic salary and includes dearness allowance, if the terms of employment provide it, and commission based on a fixed percentage of turnover achieved by the employee. You need to submit proof of rent paid through rent receipts, duly signed and stamped, along with other details such as the rented residence address, name of the owner, period of rent, PAN of the owner, etc.